Crystal clear water and lots of sharks. There’s a beach in the Bahamas that’s unlike any other in the world. It’s located 20 miles off the coast of West End, Grand Bahama, and buried like sunken treasure under crystal clear blue water. Tiger Beach is a location known worldwide for its tiger shark population. 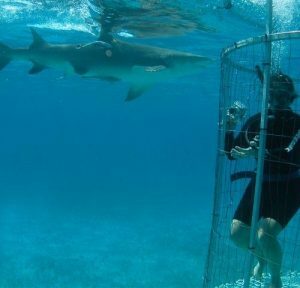 We deliver the biggest of the Bahamas sharks in the shortest amount of time. It’s easy to add a day or two of diving to any Bahamas vacation. We have a first-class shark dive team. We supply the shark cage and “hookah style” air supply system. Join a regularly scheduled weekend dive adventure aboard one of our great boats, or schedule a private shark dive adventure aboard your own yacht for family and friends. Just ask and we’ll bring our cage and crew to you. 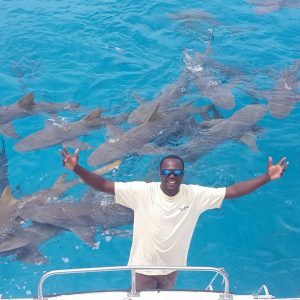 Bahamas Shark Adventures begin and end at Old Bahama Bay Marina in West End, Grand Bahama. The Marina is about 45 minute by car from Freeport/Port Lucaya. Several major airlines offer flights into Freeport, or you can take a ferry or private boat or plane to the island from nearby Florida. Our shark expedition boat departs the dock early in the morning, so you may wish to arrange accommodations at the Old Bahama Bay Resort, located next to the Marina. Travel time to the dive site at Tiger Beach will be about 2 hours. 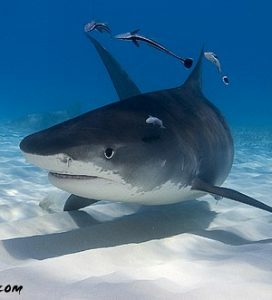 Warm, shallow, clear waters and very big sharks make “Tiger Beach” a favorite spot of underwater photographers. We conduct our dives in a custom-built shark cage designed with photographers in mind. We’ll get back to the marina late in the afternoon. Viewing Season: All year long. Cost: $875 per person for cage dive, $375 per person for topside viewing. Call for group and private charter pricing. Call 800-644-7382 for additional dates or to arrange a private charter on a date of your choice. Participant Requirements: No dive certification is required. We utilize a floating shark cage and surface-supplied air. We supply a “hookah style” air supply system, so you don’t need to be a certified diver. By eliminating the need for tanks, we make it easier for you to move about the cage and take pictures. Minimum age restrictions may apply. Trip Notes: Trips depart early in the morning and return late in the afternoon. A light lunch and refreshments are provided. Divers are required to purchase dive insurance and sign a release of liability. We’ll take you to the best spots at the best times, but we cannot control nature.There is no shark guarantee and there is no refund if you don’t see sharks. If weather prevents you from diving on Saturday, then Sunday is your dive back-up day. It is really important that you include a back-up day in your schedule. Custom Tours: Available upon request.